To ring in the new year, I'm pulling out my first three books to answer a question authors are often asked: Where do you get your ideas? For me, the answer is easy, from things in my everyday life. The idea for Bachelor Father came from our experience adopting our son from Korea. There was another family further along in the adoption process in which the adoptive mother had died just short of six months after their baby had arrived~the time requirement required to finalize the adoption. The Korean adoption agency was very strict about it's rule of only allowing married couples to adopt its children. The father was fighting to keep his son. Love Undercover comes from an article I read in The Wall Street Journal at my then day job as a financial writer. It was about a financial planner who had scammed numerous older people out of their life savings. 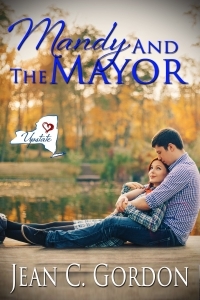 Mandy and the Mayor is a product of my interest in local current events, my daughter's stint in Americorp, and my preference for small-town life over city life. I've done both. It you check your local library, you might find the original hardcover versions of the books. They've since been republished as my eBook series UPSTATE NY . . . where love is a little sweeter. Brett Cahill is a typical bachelor. Someday he'll settle down with a wife and have kids—but just not yet. Then, his sister and her husband are killed in an accident, leaving him with Jake, the Korean toddler they were in the process of adopting. But for Brett's application to be approved he needs to be a married man and kiss his bachelor days good-bye.Adoption caseworker Molly Hennessey is determined to place every child in her caseload in a happy home with two loving parents—the type of caring home she's always dreamed of having herself. 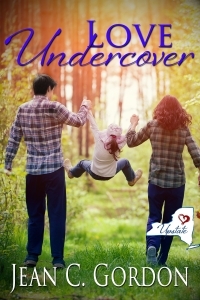 Determined, that is, until Brett comes along and disproves her lifelong perceptions of single parents.Molly holds the power to give herself the home she's always longed for and to give Brett what he wants most—little Jake. But will she realize it in time? A few too many messy divorce cases and custody battles have convinced Tina Cannon to change her specialty from family law to financial planning and move her young daughter out of the city to a place that has the small town values Tina grew up with. So the offer from her Uncle Jack to join his planning practice in Genesee, her hometown, couldn't have come at a better time. Tina is in for a few surprises, though, not the least of which is her perplexingly uncooperative and devastatingly attractive first client Devon O'Neil. Devon has ties to Genesee too. But they aren't as pleasant as Tina's. This is where his grandmother died nearly penniless, bilked out of her hard-earned nest egg by an unscrupulous financial planner—Uncle Jack. Devon, a private investigator, devises a plan to expose Jack by posing as a lottery winner looking for financial guidance. Tina, however, is upsetting his plan. She's Jack's niece and in business with him, so she must be a crook, too, right? So, why does he seem so intent on proving her innocent instead of guilty? With Tina's widowed father playing matchmaker in the background, she faces off with Devon in the securities fraud investigation that raises more than a few sparks and teaches them both that while appearances can be deceiving, love shines true. The last place Mandy Harris would choose to spend her summer is Whitmore Mills, a sleepy village in the Adirondack Mountains. She far prefers city life. But the village needs a director for its summer recreation program, and the deal is too good to pass up. The compensation includes a grant to pay off her student loans, and the experience will look great on her teaching resume. The only difficult part is her boss, Mayor Whitmore. Thaddeus Whitmore is intent on vindicating his family name and returning prosperity to his dying hometown. His father plunged the community into economic decline when he closed the family lumber mill to meet the divorce demands of his "trophy" wife. Thad’s remedy is to turn the old mill buildings into a high-class resort. He has studiously planned for every imaginable obstacle except the arrival of Mandy Harris. While Thad’s great Aunt Aggie plays matchmaker, Mandy and Thad clash on everything, from her hiring, to her recreation programs, to his resort plans. More than a few sparks fly in the process. But are they enough to burn through Mandy and Thad’s differences and ignite the flame of everlasting love? Thanks, Jean. I'm originally from upstate NY myself! I grew up in Albany.